It's only eight days until Christmas, but there's still plenty of time to get your craft on! Over the next couple days, I'll be sharing eight easy Christmassy crafts and ornaments for you to try out. 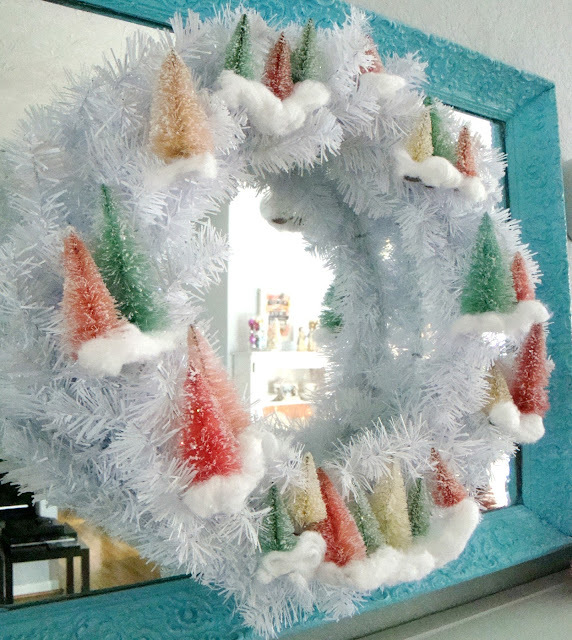 So settle in with your hot chocolate and your hot glue gun, and get to making! This Christmas season, I have been crafting up a storm in every moment of my free time. When you completely update and change out your Christmas decor, it behooves you to get a little DIY action since all new decorations can be so costly. By far, my favorite decoration obsession this year are the sweet little miniature bottle brush trees. And my obsession might have gotten out of hand! I think I have bought 50+ of these trees, and I still want more!! 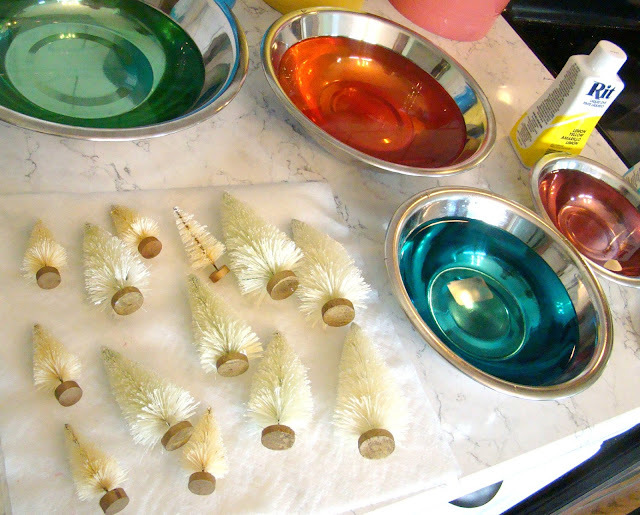 Today I'm sharing with you how I bleached and dyed my bottle brush trees to make them pastel and vintage inspired. I found bitty trees in the Christmas craft section at Hobby Lobby, as well as in the dollhouse miniature section. I also bought a 21-piece bag of trees in various sizes at Michael's for 50% off. Step One: Prepare your bleach bath. I feel like my career as a licensed cosmetologist has completely prepared my for this craft. I lighten and deposit color on hair on the regular, and this is really no different. I just used my sink since it is stainless steel. I filled it up with enough hot water to be able to submerge the trees, then dumped a bunch of bleach in (very scientific). I didn't measure because I know if I want them to bleach out faster or if they're not getting light enough, I can always add more. Here they are after a couple minutes soaking. You can see the little ones go pretty fast. I found the bigger the tree, the longer it needs to soak. 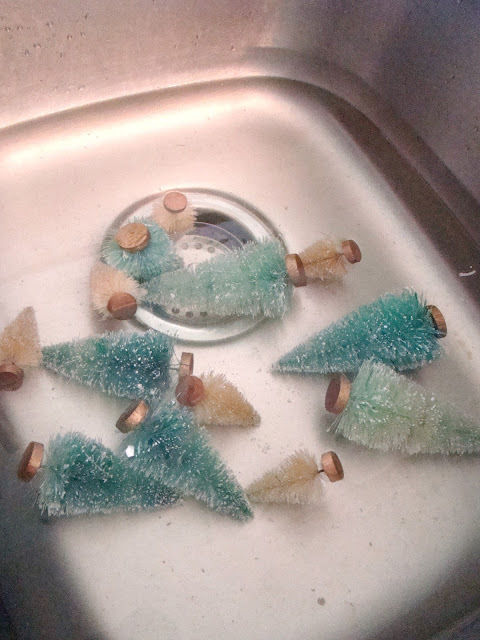 Step Two: Soak and rinse your trees. Just like with hair, it's hard to know exactly how long it will take to lift the color out to the pale shade you want. Just let them sit until you like the way they look. I discovered that it was helpful to scrub the trees a little in the bleach to help penetrate the fibers. The small ones really didn't take long at all. 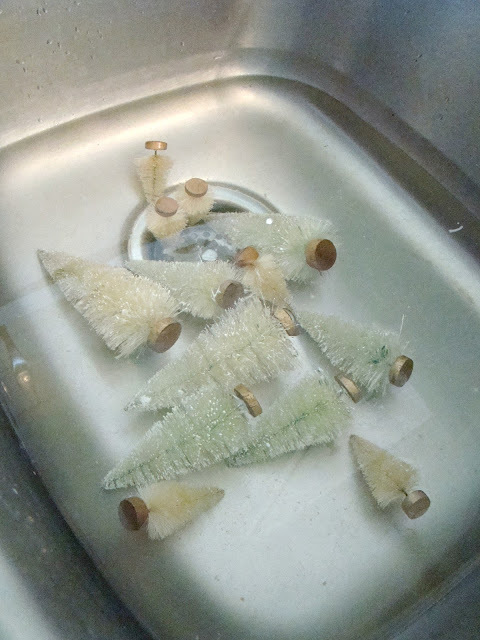 Then I rinsed each one with cool water and let it sit to dry. Step Three: Prepare the dye. 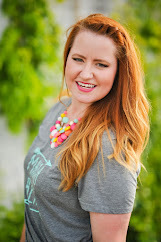 I used Rit dye in various shades to get the look I wanted. It comes in a ton of different colors, so you can pick whatever you like. I will confess, I didn't do any measuring like maybe I should have. I filled various stainless steel mixing bowls with hot water, added a good amount of salt (I don't know why this helps, but the instructions say you can do it. I found the color took much better when salt was added), then soaked my trees. As you can see, I mixed up various bowls. I was going for pale pink, mint green, and aqua. I ended up liking the red dye with lots and lots of water the best. I just dipped the trees for a few seconds into the diluted red and got a very pretty pink color. I'm sorry there's not more specific instructions, but I just winged it really. Check your trees often, and when they are a color you like, take them out and let them dry! Leave them in longer to get deeper shades, or dunk them quickly for subtle pastel tones. Ta-da! I left some of them white because I liked it so much. And you know what? If some of them turn out weird, hit them with some white or gold spray paint. Spray paint fixes everything. Step Four (optional): Add flocking and glitter. I don't have a photo explaining how I did this because it isn't necessary. But I liked how my trees felt "finished" when I added some snowy effect and glitter to them. Most of the flocking will come off when you bleach them, so this makes them look pretty again. I mixed basic white acrylic paint with basic white Elmer's glue and brushed it haphazardly onto the tips of the trees. Then while it was still wet, I poured iridescent glitter all over them. You could also choose to paint or glitter the bases, but I decided to keep them snowy white. Step Five: Decorate! 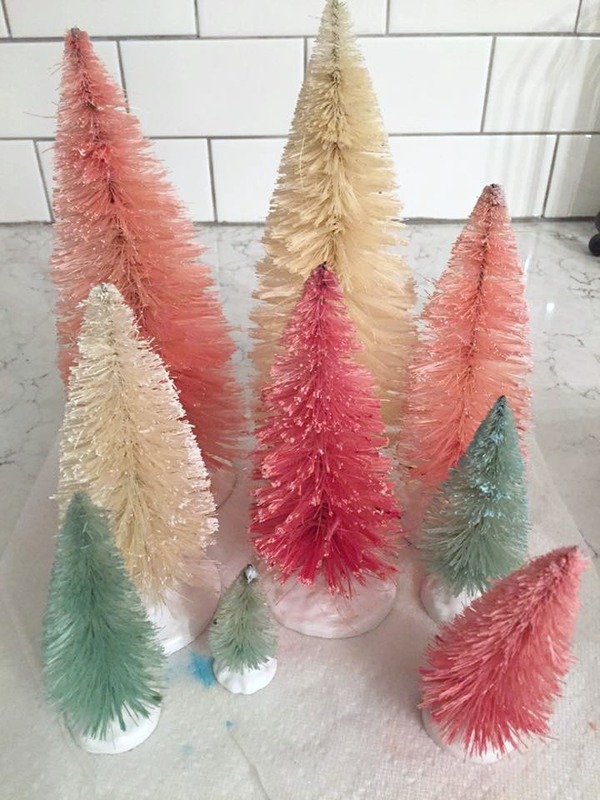 I used these little trees for a dozen things all over my house! I glued them onto little vignette ornaments (post coming soon), made two different wreaths with them, and lined them up in the kitchen to make a snowy little village. 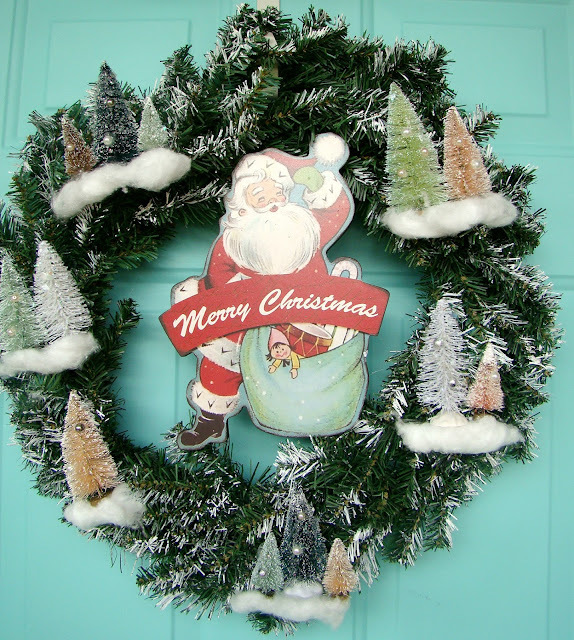 You can also hot glue small pearls and other beads to your trees to make bitty ornaments, like I did on my front door wreath. Tell me what you think in the comments! Do you share my bottle brush tree obsession? After immersing, you would just use the seeds that go underneath the water simply because they'll emerge. The floated seeds has to be discarded simply because they are empty.